Please note: the cottage is fully booked this summer. Book ahead for 2018! 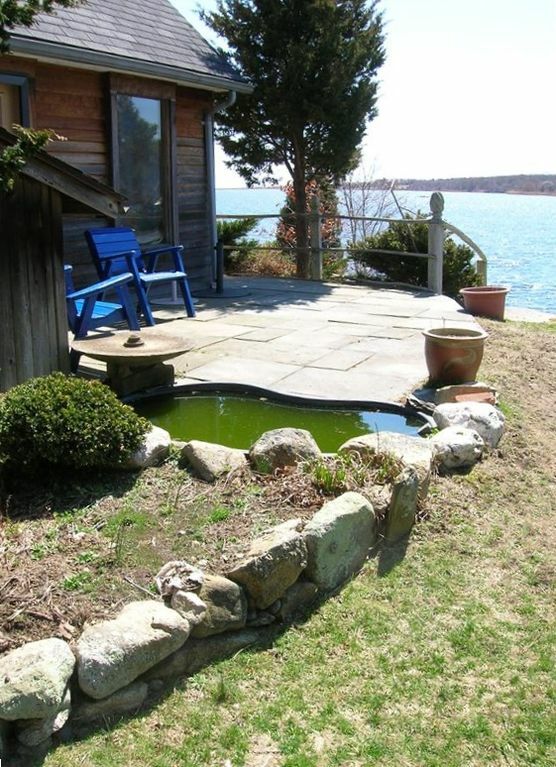 Enjoy a memorable vacation with family and friends in this newly renovated hand-crafted cottage, situated on one of New England’s most treasured, unpopulated saltwater “ponds.” The pond is perfect for boating and fishing, and you can also bike to a fantastic ocean beach at the mouth of the pond. If you prefer to drive to the ocean, you can purchase visitor privileges at a nearby beach club. The cottage comes with a canoe (and life jackets) to use on the pond. If your tastes are more landlocked, the cottage features a croquet set, a horseshows court, two furnished decks, a vegetable and flower garden, and for rainy days...a DVD player, cards, and jigsaw puzzles. Life is simple and comfortable at the cottage. There is a phone and wifi Internet connection. There is a washer/dryer and full kitchen.. A great room with peaked cathedral ceiling serves as a spacious dining and living room. The master bedroom has its own full bathroom. Although the cottage is splendidly private and off the beaten path you can easily drive to a full-service grocery store, and a variety of quaint towns, gourmet restaurants, vineyards, farm stands, old-fashioned ice cream stores, and museums. My parents built the cottage as a summer home. Since retiring, we renovated for year-round. There is no more beautiful place in the world to be! Exquisite, ever-changing views. Complete privacy. Peaceful. Connection to nature's simple wonders. Sunrise and sunsets beyond description. The vegetable and flower garden will be in full glory when the cottage is yours. Every morning you will wake delighted by the beauty and serenity of this special place. In addition to the dining room, outside dining is possible at dining tables and chairs on deck, patio, and in the garden. A clawfoot tub with hot/cold water is in the garden. We had a very special vacation staying here. The house, property and owner are wonderful! It was very private and incredibly quiet except for the sounds of lapping waves and bird song, with an amazing herb garden, huge flocks of swans on quicksand pond and gorgeous sunsets. We woke to the birds and fell asleep to the katydids. This is a very special place! We hope to return! The cottage was lovely. I stayed with my husband and my parents and we all had a wonderful time. It's very comfortable for 4 people and the property is beautifully maintained. The owner Katherine was a kind and generous host. I'm not usually fond of swimming in lakes and ponds, but Quicksand pond is pristine and the perfect temperature. I really cannot recommend the house enough. It's a tranquil, beautiful escape that's totally unique. If you need a place to disconnect from the stresses of everyday life and if you enjoy beautiful, natural landscapes, you will love this place. Beautiful, peaceful setting for a relaxing vacation. We very much enjoyed our time in the cottage. The views of the lake and a variety of birds were wonderful, and we could hear the ocean just over the ridge of the preserve. The cottage location was also wonderful. Newport, Bristol and Narragansett Bay were really easy to get to, as was all of southeast Mass. and even the Cape. In the cottage the great room was spacious, and the many windows made for good breezes. Our dogs loved the deck, too! Thanks, Katherine.